LIFE BEFORE CLOUD COMPUTING Traditional business applications have always been too complicated and expensive. They need a data center with office space, power, cooling, bandwidth, networks, servers, and storage. And a team of experts to install, configure, and run them. They need development, testing, staging, production, and fail over environ-ments. When you multiply these headaches across dozens or hundreds of apps, it's easy to see why the biggest companies with the best IT departments aren't getting the apps they need. Small businesses don't stand a chance. 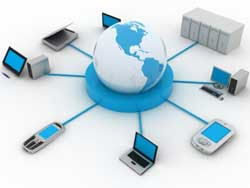 Cloud-computing: a better way Cloud computing is a better way to run your business. Instead of running your apps yourself, they run on a shared data center. When you use any app that runs in the cloud, you just log in, customize it, and start using it. That's the power of cloud computing. Businesses are running all kinds of apps in the cloud these days, like CRM, HR, accounting, and custom-built apps. Cloud-based apps can be up and running in a few days, which is unheard of with traditional business software. They cost less, because you don't need to pay for all the people, products, and facilities to run them. And, it turns out they're more scalable, more secure, and more reliable than most apps. Plus, upgrades are taken care of for you, so your apps get security & performance enhancements and new features automatically. The way you pay for cloud-based apps is also different. Forget about buying servers and software. When your apps run in the cloud, you don't buy anything. It's all rolled up into a predictable monthly subscription, so you only pay for what you actually use. Finally, cloud apps don't eat up your valuable IT resources, so your CFO will love it. This lets you focus on deploying more apps, new projects, and innovation. The bottom line: Cloud computing is a simple idea, but it can have a huge impact on your business. Cloud computing platforms are growing in popularity, but why? What unique advantages does a cloud computing architecture offer to companies in today's economic climate? And what just what is cloud computing, anyway?” Let's explore the cloud computing infrastructure and its impact on critically important areas to IT, like security, infrastructure investments, business application development, and more. Most IT departments are forced to spend a significant portion of their time on frustrating implementation, mainte-nance, and upgrade projects that too often don't add significant value to the company's bottom line. Increasingly, IT teams are turning to cloud computing technology to minimize the time spent on lower-value activities and allow IT to focus on strategic activities with greater impact on the business. The fundamental cloud computing infrastructure has won over the CIOs of some of the world's largest organizations. These once-skeptical executives never looked back after experiencing first-hand the host of benefits delivered by cloud computing technology. l Proven Web-services integration. By their very nature, cloud computing technology is much easier and quicker to integrate with your other enterprise applications (both traditional software and cloud computing infrastructure-based), whether third-party or homegrown. l World-class service delivery. Cloud computing infrastructures offer much greater scalability, complete disaster recovery, and impressive uptime numbers. l No hardware or software to install: a 100% cloud computing infrastructure. The beauty of cloud computing technology is its simplicity… and in the fact that it requires significantly fewer capital expenditures to get up and running. l Faster and lower-risk deployment. You can get up and running in a fraction of the time with a cloud computing infrastructure. No more waiting months or years and spending millions of dollars before anyone gets to log into your new solution. Your cloud computing technology applications are live in a matter of weeks or months, even with extensive customization or integration. l Support for deep customizations. Some IT professionals mistakenly think that cloud computing technology is difficult or impossible to customize extensively, and therefore is not a good choice for complex enterprises. The cloud computing infrastructure not only allows deep customization and application configuration, it preserves all those customizations even during upgrades. And even better, cloud computing technology is ideal for application development to support your organization's evolving needs. l Empowered business users. Cloud computing technology allows on-the-fly, point-and-click customization and report generation for business users, so IT doesn't spend half its time making minor changes and running reports. l Automatic upgrades that don't impact IT resources. Cloud computing infrastructures put an end to a huge IT dilemma: If we upgrade to the latest-and-greatest version of the application, we'll be forced to spend time and resources (that we don't have) to rebuild our customizations and integrations. Cloud computing technology doesn't force you to decide between upgrading and preserving all your hard work, because those customizations and integrations are automatically preserved during an upgrade. l Pre-built, pre-integrated apps for cloud computing technology. Threats : Biggest threat for Cloud Computing apart from security concerns, theft or privacy! is that no company in the world can guarantee availability Denial of service attacks are pernicious and debilitating. Malicious hackers are looking for the most conspicuous and high profile installations ao that they can have the thrill of seeing their creations bring down the best of the best on the net! Cloud computing as in Gmail for personal use or YouTube for watching teens with straws up their nostrils having fun singing or dancing may not have huge impacts. But will Cloud Computing scale up to serious use when it comes to mission critical applications of enterprises? Seems like we may have some way to go before we talk about serious use of Cloud Computing in the Enterprise! Once we get past this pesky problem of outages due to attacks.